Compare discounts for Hotels Motels in Philadelphia, Pennsylvania! The birthplace of the nation, Philadelphia, PA, 'the city of brotherly love,' is a thriving modern metropolis. Located between the Delaware and the Schuylkill rivers, Philly, like other big east coast cities, sprawls far and away with a mix of residential and commercial areas. The core area of downtown, however, is compact, easy to navigate and packed with some must see sights. Renovated South Philly has historic buildings lining quiet streets as well as fine restaurants and boutique shops. From the Liberty bell to Independence Hall, Philadelphia is one of those places each and every American should visit at least once. Escape to the Omni Hotel at Independence Park - a AAA, four-diamond, European-style luxury hotel. Located in the center of Philadelphia's most historic square-mile, the restored Loews Hotel maintains the historical integrity of the PSFS bank building, which was built in 1932. Connected to the Pennsylvania Convention Center and Gallery Mall, the Philadelphia Marriott Downtown is ideally situated in the city's business section. The Club Quarters Philadelphia is located in the central business district and across from Liberty Place (70 boutiques and restaurants). Philadelphia Hotel Windsor is a first class newly renovated all-suite hotel located in the heart of Philadelphia's business and cultural district. 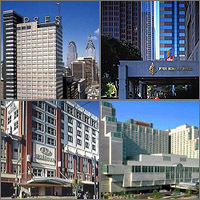 Embassy Suites Philadelphia Center City is an all-suite full-service hotel located just off historic Logan Square. The Hyatt Regency Philadelphia is the only waterfront hotel providing ferry access to sites both in Philadelphia and the Camden waterfront, it's just a walk away from the Liberty Bell and Betsy Ross House.